Here's the wild story of how a suitcase full of pepperoni and a flock of seagulls caused chaos in a hotel room... and led to a lifetime ban from the Fairmont Empress hotel in Victoria, Canada for one man. "This may seem like an unusual request, but I write to you today seeking a 'pardon.'" So began an 1,100-word letter from Nick Burchill of Nova Scotia to the Fairmont Empress hotel in downtown Victoria, Canada. Burchill was coming "hat-in-hand," as he wrote in his missive, to apologize and ask forgiveness for an incident that got him banned for life from the upscale establishment 17 years ago. The following may sound incredible, but hotel staff say it's true. In 2001, Burchill, a former member of the Canadian Naval Reserve, traveled to Victoria for a work conference, according to his letter, which he published in a widely shared Facebook post last week. Knowing he'd see some Navy buddies during the trip, he brought with him a suitcase full of pepperoni from their favorite deli in Halifax. After checking into the Fairmont Empress on a chilly April day, he noticed there wasn't a refrigerator in his room. So he laid the bundles of meat by an open window to keep them cool. Then he stepped out for a stroll around the city. He returned hours later to a scene out of an Alfred Hitchcock film. A flock of seagulls, dozens of them, had descended on the pepperoni and invaded the room, he said. When Burchill tried to clear them out, chaos ensued. "They immediately started flying around and crashing into things as they desperately tried to leave the room through the small opening by which they had entered," Burchill wrote. "The result was a tornado of seagull excrement, feathers and pepperoni chunks and fairly large birds whipping around the room. The lamps were falling. The curtains were trashed. The coffee tray was just disgusting." Hotel employees were aghast. The mess was so bad that the management sent a letter to Burchill's employers saying he could never stay there again. Burchill, by all accounts, abided by the decision. But on Sunday, the Fairmont Empress decided to open its doors to him once again. Hotel staff said in a statement that they had reviewed his request for a pardon and lifted the ban. Burchill dropped by the front desk over the weekend and gave the managers a pound of Brothers TNT Pepperoni as a "peace offering," he told CBC News. A picture posted to his Facebook account shows him and two hotel staff members laughing together. The incident is now apparently Fairmont Empress lore, according to Burchill. "When I was talking to the people at the desk and the manager, they did say that they had heard this story from a long-term employee that works there," he told CBC News. "I was just kind of in and out," he added. "I didn't want to overstay my welcome." Tracey Drake, the hotel's public relations director, told the Canadian Press that some staff members thought Burchill's letter was an April Fools Day prank. But they checked the records and, sure enough, the seagull story was no joke. Nor was Burchill's permanent ban. "It is absolutely a true story," Drake said. "The hotel followed up with his employer afterwards, saying he's not welcome back at the hotel due to the damage in the room," she told the Canadian Press. "He's correct. The lamps were broken. The room was trashed. It's a really funny story to tell 17 years later, but I was sitting here thinking about the housekeeper and what her first reaction must have been when she opened that door." In retrospect, the whole situation was ripe for trouble. The fourth-floor room in which Burchill stayed during the ill-fated trip faced Victoria's inner harbor, a stone's throw from the docks. 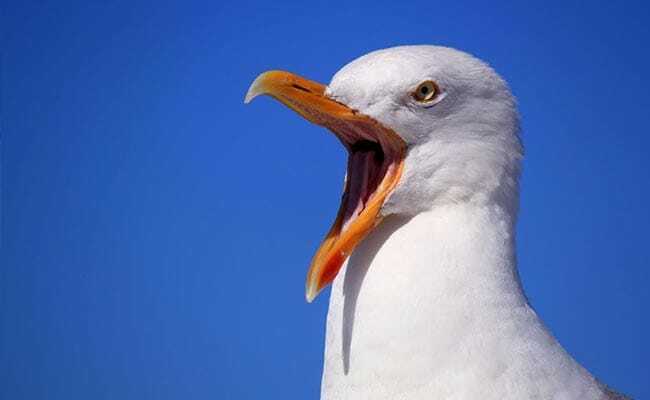 As anyone who has spent time near a body of salt water can tell you, seagulls are aggressive creatures that will scavenge for just about anything - even landfill trash, as Popular Science notes. Pepperoni is definitely on the menu. In his letter, Burchill recalled his shock when he opened the door to his room that afternoon in 2001 and saw "an entire flock of seagulls" laying waste to the place. There must have been 40 of them, he said. "In case you were wondering, Brothers TNT Pepperoni does NASTY things to a seagull's digestive system," he wrote. "As you would expect, the room was covered in seagull crap." After the initial mayhem, Burchill managed to shoo most of the birds out by opening the remaining windows, but one stayed behind. "In a moment of clarity," he said, he grabbed a towel, wrapped up the gull and threw it outside. The bird wasn't harmed, but the projectile did startle a group of tourists milling around on the hotel lawn, he said. As he scrambled to clean up, he let a running hair dryer fall into the sink, triggering a power outage, he wrote. That's when he called the front desk for help. "I can still remember the look on the cleaning lady's face when she opened the door," Burchill wrote. "I had absolutely no idea what to tell her, so I just said, 'I'm sorry,' and I went to dinner." He returned for the night to find that his belongings had been moved to a smaller room. His employer got the lifetime ban notice shortly after. Burchill wrote in his letter that he was younger and more foolish then, and that he wanted to take responsibility for his actions. In a Facebook post Tuesday, the hotel staff stated they were "as amused as everyone" to read his entreaty. "We look forward to welcoming Mr. Burchill to Fairmont Empress again in the future," the post read. "He will be delighted to know that the rooms have modern amenities and air conditioning to keep his pepperoni cool."